Bloom Association » Is the MSC turning its back on seabird conservation? Is the MSC turning its back on seabird conservation? 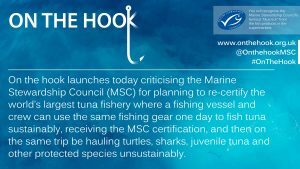 Completely missing the point of the On The Hook campaign, the MSC keeps using the chain of custody argument to justify its downward slide. Let us help them understand why we do not need yet another public consultation but a clear and swift change of direction. Seabird interactions and bycatch is an enormous problem in fisheries worldwide with hundreds of thousands killed or injured every year. For instance, each year bycatch may exceed 320,000 birds from longline fisheries, and likely exceeds 400,000 birds from gillnet fisheries. Seabirds are further among the most threatened groups of birds, with approximately 29 percent of seabird species listed in the International Union for Conservation of Nature (IUCN) Red List of Threatened Species as critically endangered (CR), endangered (EN), and vulnerable (VU). Now let’s assume that the MSC is a flawless market tool and that it does, as it likes to proclaim, only reward the fisheries and fishers that are making concerted efforts to minimise their impact on the marine environment. In such a set-up, it would be unthinkable that the MSC turned their back on all the conservation gains that have been made while addressing the impacts that certified fisheries have on seabird populations. Would the MSC really contemplate recognising only a part of a fishery through certification while at the same time allowing it to continue with environmentally unfriendly practices that could seriously harm seabird populations — in a ‘business as usual’ sort of attitude? Surely not! With the MSC playing deaf with regards to the imminent recertification of the so-called Parties to the Nauru Agreement (PNA) fishery, this is however exactly what it is saying. As a reminder, tuna purse seiners targeting tropical tunas (skipjack, bigeye, albacore, and yellowfin tunas) will opportunistically set their nets either around Fish Aggregating Devices (FADs) or around free swimming schools that are not associated with FADs. This latter category — “FAD-free” tuna — has been touted for sustainability-minded consumers as a better choice than FAD-caught tuna. However, this distinction is nonsensical. As recently explained by Dr Victor Restrepo — Vice President of Science of the International Seafood Sustainability Foundation (ISSF) and a member of the MSC’s Technical Advisory Board — these market distinctions are dubious as most purse seine vessels (which supply more than 60% of the world’s tuna catch) fish on both FADs and free swimming schools during a single fishing trip! Thus, he argues that the recent tendency by people involved in sustainability discussions to talk about FAD and free school sets in the tropical tuna purse seine fishery as if they were two different fisheries (such as the government and industry groups that have sought MSC certification only for the tuna products caught from their free swimming schools) is a contrived situation. The vast majority of managers and scientists involved in tuna fisheries will agree with Dr Restrepo that a holistic approach needs to be followed if the overarching aim is to successfully, sustainably regulate all the world’s tuna fisheries, and that all the impacts of tuna purse seine fisheries need to be addressed. So what is the relevance of the FAD-free story to seabirds and the impacts that fishing operations could have on vulnerable seabird populations? 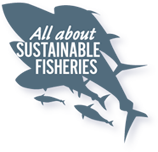 By agreeing to the compartmentalised approach with FAD-free tuna fisheries, the MSC has opened up a hornet’s nest and many conservationists are urging them to urgently reconsider this approach before their logo becomes even more tainted with serious credibility issues. Let’s take the example of bottom longline fisheries. Adding line weights to the fishing line ensures a faster sink rate of the line, thereby reducing the chances of seabirds becoming entangled in hooks at the surface. However, what the MSC suggests is that as long as you implement a good traceability system on the boat and on the land to separate your ‘good’ catch from your ‘bad’ catch, you are okay. This logic is obviously absurd! When the longline vessel uses no line weights and catches and kills seabirds, they keep that part of their catch separate on the boat. This is then the uncertified component of their catch. Later in the same day, when they supposedly apply best practice and add line weights to their sets, thereby minimising seabird mortalities, their catch from these lines becomes the ‘certified fishery’ and can be sold with the MSC logo on products with assurances that it was caught in a ‘sustainable fishery’. Seafood consumers are kept in the dark about the true nature of these compartmentalised fisheries and are not told about the ‘dirty secrets’ connected to the other part of the catch, caught during the same fishing trip, when hundreds of seabirds were killed during fishing operations. It is obvious that such an approach will not drive conservation efforts in the right direction and the MSC could in fact become implicitly involved in driving overfishing and bad management practices. It will be a sad day when the first contrived fishery that has serious impacts on seabirds becomes certified, and the danger of this happening is real. The solution is obvious: the MSC must abandon the idea of certifying contrived fisheries that are not ‘real’ fisheries, and focus on driving improvements in all components of a fishing vessels’ activities. Wiedenfeld, D. A. 2016. Seabird bycatch solutions for fishery sustainability. American Bird Conservancy. 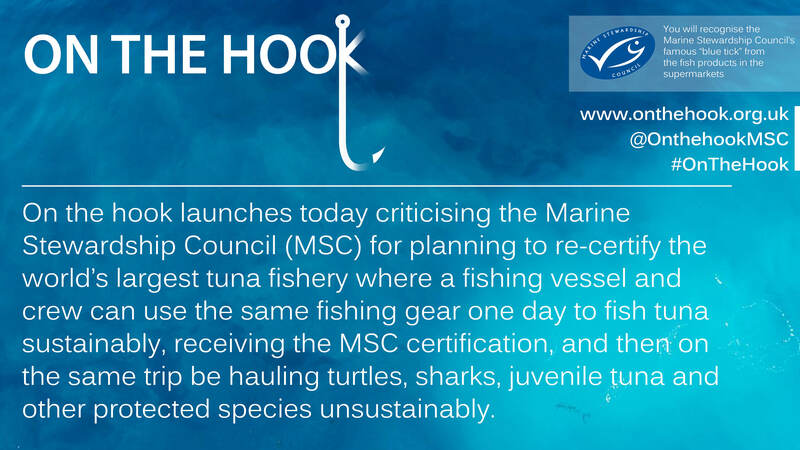 We know that this is unfortunately not true, as the MSC has always been certifying extremely controversial fisheries (reduction fisheries, hydraulic dredge fisheries, deep-sea bottom trawling fisheries etc.) and is quickly losing its scientific aura, but this is not the discussion here. It is well recognised that tuna purse seine fisheries have major environmental impacts that have led to overfishing of some tuna stocks through high catches of juvenile tuna as well as major impacts on vulnerable shark and other species. Most of these problems are associated with their fishing activities on FADs. With the exception of some seasonal prohibitions set by RFMOs and natural seasonal changes in free school availability, the two set types do not make up two different ‘fisheries’. Some fishing captains have argued that by adding more line weights to demersal longlines they have seen a drop-off in fish catch rates. Therefore, they may see an interest in keeping some lines without weights.